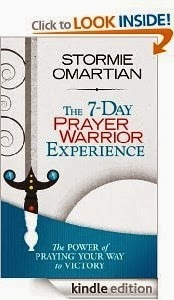 The 7-Day Prayer Warrior Experience is a free eBook from bestselling author Stormie Omartian, developed using excerpts from Prayer Warrior and Prayer Warrior Prayer and Study Guide. Are you equipped for spiritual battle? Take the next seven days to “put on the whole armor of God, that you may be able to stand against the wiles of the devil” (Ephesians 6:11). Join Stormie as she explains the pieces of armor, what they mean, and how they can help you be a prayer warrior in your spiritual battle. With devotional thoughts, suggested prayers, ways to dig deeper, and opportunities to connect with Stormie and a whole community of prayer warriors, The 7-Day Prayer Warrior Experience will empower you with the truth that “He who is in you is greater than he who is in the world” (1 John 4:4).